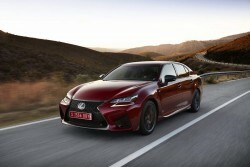 High-revving V8 engine for the quirky, but very likeable Lexus GS F.
We can't think of another high-performance sports saloon powered by a naturally aspirated V8 engine producing nearly 500hp, which would be excuse enough to like the new Lexus GS F. Thankfully that's not the only reason we do. 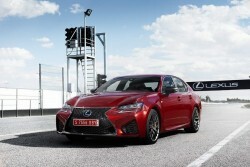 The Lexus GS F is the latest in a line of high-performance Lexus models named after the Fuji Speedway in Japan. 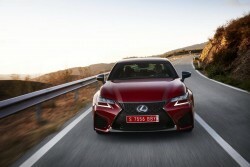 It follows hot on the heels of the RC F coupé and uses that car's powertrain, unchanged. 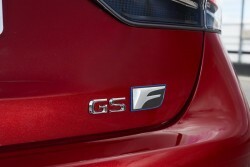 Hence, the GS F a bit of an anomaly in the performance saloon market, as its 5.0-litre V8 petrol engine is naturally aspirated where all others are supercharged or turbocharged. A maximum of 477hp is produced at a heady 7,100rpm and there's also 530Nm of torque, albeit at a relatively high 4,800- to 5,600rpm. 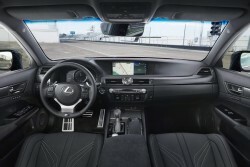 In spite of all that, Lexus saw fit to add in a new Active Sound System to enhance the engine noise audible within the cabin. It's switchable, allowing you to discover that it does most of its work at low speeds when you're just ambling around. 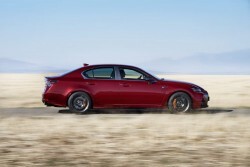 Bolted to that V8 engine is an eight-speed automatic gearbox Lexus calls Sports Direct Shift and power is sent to the rear wheels via a torque vectoring differential with electronic control. While the gearbox operation is determined by the Drive Mode Select system (Normal, Eco, Sport S and Sports S+ settings), the driver can also choose from Standard, Slalom and Track modes for the rear differential. On top of that, there's the VDIM (Vehicle Dynamics Integrated Management) system, with Normal, Sport and Expert modes controlling the anti-lock brakes, stability control and traction control, while also talking to the differential to make everything run smoothly. Alongside all this technology you'd expect the GS F to feature some fancy adaptive dampers, but in fact it uses fixed rate ZF Sachs dampers at each corner, along with double wishbone suspension up front and a multi-link design at the rear. 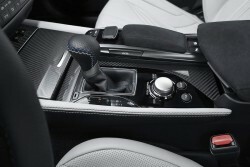 This controls forged alloy wheels 19-inch in diameter, shod in ZR-rated tyres - the rears wider. A Brembo brake system employs 380mm ventilated discs up front, gripped by six-piston callipers, with 345mm discs out back and four-piston callipers. In spite of the focus on the driving experience, the Lexus GS F is a luxury car first and foremost and it's equipped appropriately, with semi-aniline leather upholstery, heated and vented seats, satnav and a lot lot more on the list of standard equipment. It also comes with an even more aggressive visual makeover than the GS F Sport models (much of it in the name of aerodynamics), plus plenty of bespoke items inside to differentiate the F from other versions of the GS. Pricing is £69,995, which is £10,000 more than the standard RC F, but less than most comparable sports saloons, such as the BMW M5 and Mercedes-Benz E 63 AMG. Jarama is a great old circuit, less than an hour north of Madrid and once home to Formula One cars. It's now way too small, run down and underfunded to attract the big league, but it's still a hell of a place to launch a road car, especially one weighing in at nigh on 1,800kg and packed with as much luxury equipment as it is driving technology. But Lexus knew what it was doing. The track was damp as we graduated up through the various driving modes, but it held little fear for the GS F.
The long start finish straight is on a downhill, so the slight kink into the braking zone left at the end looms large in your windscreen sooner than you expect every single lap. Yet even with increasing confidence and speed the GS F's big brakes haul it securely and stably down to the turn in point at the entrance to the first (of many) flowing hairpin. The nose obediently tucks in to the apex and the corner widens, allowing you open the steering and ease the car to the outside of the track. Get the power down a little earlier and the rear differential can be felt cleverly divvying up the engine output, finding traction even on wet tarmac to give you the confidence to push on faster. Next it's a slower left-hand hairpin with a really late entry, followed immediately by another to the right. You get on the power earlier here as there's loads of room on the outside and the car smoothly scythes through it and gets back up to speed again, encouraging you to use all the revs and hear the rich V8 roar before it bounces off the 7,300rpm limiter. Then it's time to thread through some puddles at the apex of a sweeping uphill left-hander. The car twitches through these, but lets you know exactly what is going on as it does so. A blind crest right tries to tease you into turning too early for the quick left before yet another long right-hander. Then it's time to take a brave pill on the run back down the hill, dab the brakes briefly before diving for the inside of a hidden left-hand turn following some faded black and yellow kerbing, then allowing the car to ease to the outside in preparation for yet another long left. The final corner of the track reveals how stable and adjustable the GS's chassis is, as it's super-fast and yet also damp, but we fly onto the straight in a bellow of revs and start it all over again. The fact that I was able to retain most of the circuit layout in my head reveals that the GS F was not taxing to drive on track, and we didn't hang about either. Yet it was hugely enjoyable. That was emphasised later on in the Spanish countryside, which was hit with a deluge. Though we hankered for some time on the excellent twisting roads in the dry it revealed how sorted the chassis is. The differential is effective enough to allow more confident drivers to switch off the VDIM system completely. It still finds immense traction and there's enough feedback coming through the quick steering and the seat of your pants to tell where the limits of adhesion are. Don't get me wrong; the GS F is not a super-sharp sports car masquerading as a big saloon, but it's much more engaging to drive than you might wager, and yet it's also better resolved a car than the RC F it shares so much with. 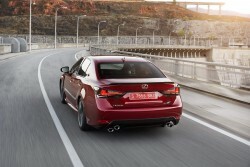 If you 'get' Lexus and have decided you're going to treat yourself to one of its F models, then we can confidently say that the GS F is the current pick of the crop. We prefer its looks, it's more practical and it drives in a more consistently satisfying manner than the big coupé. Whether it's good enough to convince buyers to choose it over twin-turbocharged and supercharged alternatives from the default luxury marques isn't so clear cut, but we're certainly glad it's around to create this conundrum.